It’s the mid-90s and I’m home from college, standing in Hope’s room. I wouldn’t know for another decade the similarities between her room and those of my other friends with Down syndrome: impeccably neat, bed made with extra pillows and stuffed animals. Our two other sisters and I went away to school, and Hope and her room sadly stood the same in time. “Oh! I’m sorry!” … For what? “That’s so cute.” … Cute? “My mother’s cousin had DS and he’s dead now.” … Sad! “My neighbor has DS.” … Can I have his/her phone number?! “Do you wish there was a cure?” … A cure? The room started spinning and I sat on her bed next to the Alf doll. Information was coding in my brain quickly, mental tapes were rewinding and replaying scenes from life, then my thoughts cleared as I accepted that I know nothing – perhaps a mental defense mechanism…? Four girls - myself, my twin, Rebecca... and cousin Megan… standing where Hope should be. Everything I thought I knew about Hope’s self-confidence and self-identity was now in question. She always made it loud and clear that she did not like Down syndrome, and she screamed every time she heard the word. But she had a happy life and… wait… her sisters all started driving, packed up, and left home…was her life happy? Did she like who she was? Gulp… would she wish for a cure? “The Cure” – a depressing gothic rock band and an ethical/moral dilemma. I love my sister Hope. She’s hysterically funny, grouchy, smart, stubborn, driven, independent and dependent at the same time. She's an amazing a dancer, and a really good dirty dancer too (which we now have rules against performing in public). She is a hard worker with three jobs, a confident yet terrible singer, thoughtful, loving, and wicked. She is Hope. And only she is Hope. 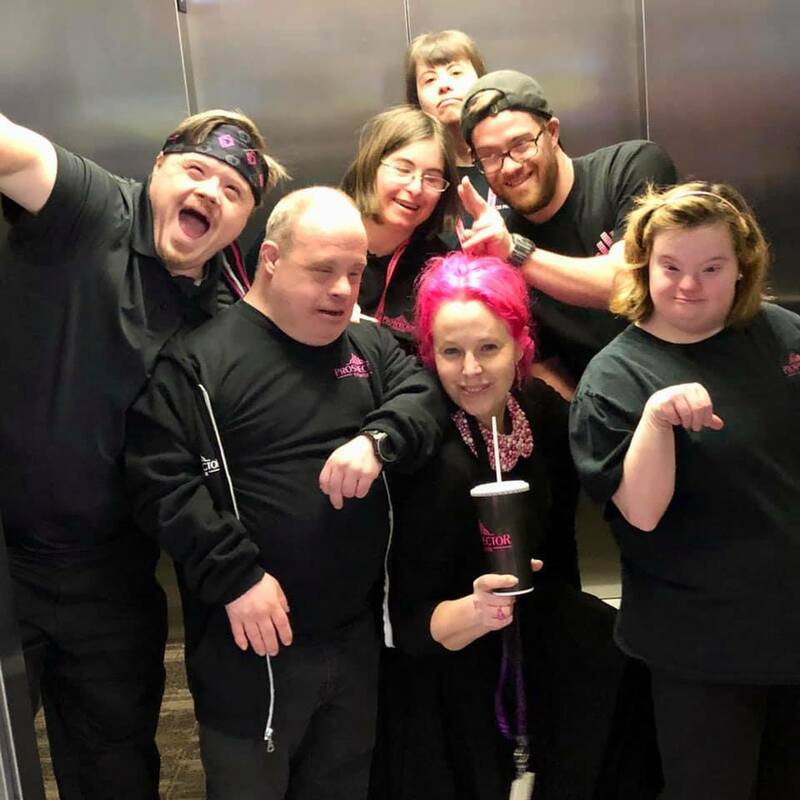 I work alongside people with Down syndrome. They are some of my favorite people to be around, in and out of work. While they all share some astonishingly similarities, talents, and character traits (Full House DVDs, Elvis, dancing, etc. ), they are all very different. I know people who love and rock having DS; I know others who are angry, cry, and wish it could be undone. I know some who seem to not like it but accept it; others who know they “have it”, accept it, and don’t seem to notice much difference in themselves. Often people think everyone with DS is the same. No way. That’s why I love them so much. They are so extra from everyone else, from each other, I don’t want a cure for Hope. That would disappear our Hope and replace her with another sister – or a cousin Megan – and I don’t want that. I want Hope. But what about Hope? It’s hard to know if Hope would take a magic potion that would remove the DS. I think she is happy with who she is, but there are a lot of unknowns and serious health complications people with DS face that shorten, and lessen, their quality of life. In the 1960’s, the life expectancy of a baby with Down syndrome was 10 years old! Today it is 60. That is thanks in part to medical advances in fixing cognitive heart defects (a common complication of DS), advancements that help doctors treat babies born with low birth weight, and deinstitutionalization and laws that help protect people with DS. Alzheimer’s Disease hits people with DS at a disproportionally high rate – an estimated 50% will have Alzheimer’s by age 47 (Hope turns 40 this year). She marches to the beat of her own drums, and I don’t even know how early-onset Alzheimer’s would be diagnosed in her. This is scary. I wish there was a treatment and a cure for this. These stats feel more like a “Cure” song. There is a glimmer of hope for the future… A very bright glimmer, powered by neuroscientists, biologists, engineers, and computer scientists dedicated to finding ways to improve the quality of life of people with Down syndrome. Yesterday, Massachusetts Institute of Technology (MIT) announced the creation of a $30 million center to study Down syndrome. Scientists at the center will examine ways to improve cell function and develop technologies to enhance their social and practical skills! Yay! I also can’t wait to share some challenges and techno-strategies we have developed at the Prospector to help people succeed in integrated and competitive employment! These MIT changemakers are also planning on “analyzing genomic data to find ways to predict the severity of symptoms and use 3-D brain mapping to scrutinize the effects” of DS on brain cells. BOOM! I translate this to mean “hope for Hope.” I don’t want to lose Hope at 60. I don’t want to lose her brain to the terrible Alzheimer’s. This generous gift to MIT from the Alana Foundation will advance understanding, ability, and inclusion. This donation will also fund a four-year program called “Technology to Improve Ability”, in which MIT says, “creative minds around the Institute will be encouraged and supported in designing and developing technologies that can improve life for people with different abilities.” This gift was made possible by a wealthy Brazilian family who have a daughter with Down syndrome – a thank you card and gourmet popcorn will be on its way shortly! According to MIT, this is the largest individual gift ever given to the study of Down syndrome. My favorite part about this is that there was no talk of a cure. There was no talk of prevention. There was talk about increasing quality of life, studying the brain to map and understand Alzheimer’s, innovation, and all other positive biological and communication technology. There is no talk of reversing or wiping DS from the planet – thank goodness! A world without DS would be a very sad, and less sparkly, world. This gift, paired with MIT’s ongoing mission to create a better tomorrow, sends a message across the globe: people with Down syndrome are important and need scientists to develop tools to extend quality of life. Hope’s current bedroom is slightly different than the one she called home in the 90’s. The tidiness, stuffed animals, and DVDs remain, but there are new additions. Her shelves have many, many, many photos in frames. The photos show all of Hope’s travels, but most of them depict her favorite places: her three jobs, standing with the people she loves the most - her coworkers. I snuck a picture of myself into the mix, it was removed, and never mentioned once… at least I tried. What’s the change? I think it’s her jobs. When Hope didn’t have a job, and the rest of us sisters left the house, she didn’t want to be herself. She wanted wings, and she wanted to fly like her sisters. Hope dove into her jobs like a fish in water. That reminds me… Hope also has an individual synchronized swim routine she is barred from performing in public. I love DS. She loves to work, she loves to get paychecks, she loves to go to the bank. She loves socializing with her work friends. She loves the feeling of independence and the freedom of choice her hard-earned money brings. The Prospector Theater was built for meaningful employment. Every day we help people with and without disabilities to build professional successes and strategies to fly. I’ve known that meaningful work gives me hope for Hope, and with the new center from MIT, that’s giving me hope for hope for Hope – or H3, like a triplicate chromosome, where all the sparkle lives, on this day March 21st, 2019. Valerie with some of her fellow Prospects with Down syndrome.